Here's the next of my ancient history printables. 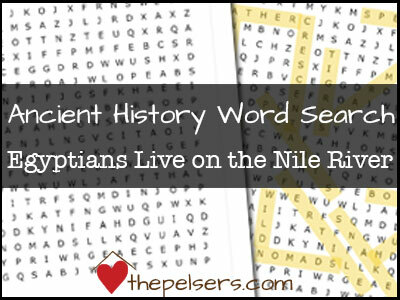 This one is a word search on the Egyptians Live on the Nile River. It corresponds with Story of the World, Volume 1, Chapter 2, but you can use it for any studies of the early Egyptians. This covers words relating to the divided upper and lower kingdoms and the uniting of Egypt by King Narmer (Menes). Perfect timing!!! We just started this chapter this week 🙂 Thanks so much for sharing! Does this printable still exist???? I cannot find anything to click on?? Hi there, I would love to use this with my son as I’m using SOTW this year but the link is not working for me. Can you help? Thank you in advance!